Used in Life Science applications. 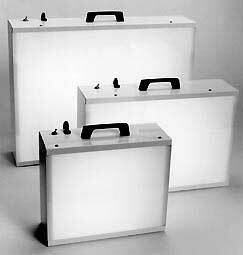 These steel light boxes are ideal for clean rooms, inspection, X-ray and slide viewing. They come with a handle, acrylic diffuser and a heavy duty power cord. The cabinet is made from cold rolled steel. The cabinet finish is a white baked on powder coating for a durable surface.